George Graham Reviews String Planet's "Songs from the Home Planet"
There are musical groups that are put together to have the right combination of instruments for a band, recruiting for example a bassist or a drummer to fill out the needs of a rock band. And there sometimes groups that arise from people who happen to enjoy playing together even though their instrumentation is non-standard. The latter is what we have for you this week -- a group called String Planet whose two principal members play a viola and a Chapman Stick. The only other instrumental presence is percussion. 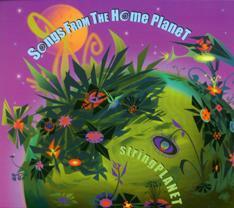 They call themselves String Planet, and their new all-instrumental CD is called Songs from the Home Planet. Southern California-based String Planet are violist Novi Novog and Stick player Larry Tuttle, two first-rate instrumentalists who were previously together in the mid 1990s in a band called Freeway Philharmonic. Ms. Novog is probably the better known of the two, being part of a group called Chunky, Novi and Ernie back in the 1970s. The Los Angeles area native has also had a career as a studio musician, playing on such recordings as the Doobie Brothers' Black Water, and Prince's Purple Rain. She also was briefly in Frank Zappa's band. Larry Tuttle is originally from the Seattle area and started in the classical world, playing string bass. But by high school he was very much into the art rock art rock of groups like ELP and Gentle Giant. He was in a band called Russia, later called Force 10, who had a couple of major-label albums. At the time, Tuttle was playing electric bass, but in 1984 discovered the Chapman Stick, the 12-stringed instrument that is essentially a long fret-board played by tapping both hands on the frets. It allows one to emulate a keyboard, being able to play both treble and bass lines at the same time. Probably the best-known Stick player is Tony Levin, of Peter Gabriel's group and King Crimson. After Freeway Philharmonic a dozen years ago, Tuttle and Novog renewed their musical association as String Planet. Most of the music on String Planet's CD consists of original material by Stick player Tuttle, but they also cover a very eclectic bunch of songs from three classical pieces to a Beatles song to a couple of old instrumental novelty tunes from decades ago. They are equally wide-ranging in the way they arrange the tunes with influences ranging from art rock to blues. And it's also quite impressive to hear the sound they get with just their curious pairing of instruments. The percussionist is Jo Pusateri, another Los Angeles studio player who adds a lot of interest to the music with instruments from drum set to vibes to things like castanets. The percussion frequently helps to enhance the whimsical quality of much of the music on the CD. Songs from the Home Planet the debut CD by String Planet is a clever and enjoyable instrumental recording by an odd pairing of instruments which works surprisingly well. The viola and the Chapman Stick would seem to have little in common, but in the hands of a couple of people who obviously enjoy playing together, and are really good at their respective instruments, the result is creative both sonically and in terms of their interesting arrangements. The CD is also a nice mix of engaging original compositions with ingenious and often whimsical treatments of some old familiar songs from rock to classical. The third member, percussionist Jo Pusateri contributes a lot with his instrumental colors, but the pairing of the viola and the Stick is a surprisingly full sound. Our grade for sound quality is about a B-plus. There is good clarity, and a nice mix between the acoustic sound of the viola and the directly wired-in sound from the Stick, and there are some clever studio tricks. But we'll give demerits for the poor dynamic range from the totally unnecessary and excessive Peter Gabriel/compress.html">volume compression that makes everything the same boring volume -- loud. As a self-styled music critic, I somehow feel that it's my job to put music into categories, if only to make it easy for people to make reference to it. Most of the time that pigeon-holing is quite easy. String Planet doesn't fit neatly into anything. It's perhaps New Acoustic music meets jazz-rock-fusion and art rock, with some film score music thrown in. But it's just that avoidance of expectations that makes this so appealing for me.